Recorded live in 1980 and originally released as a bootleg LP entitled Among the People. After the release the LP producer Kostas Yannoulopoulos and The Art Ensemble patched up their disagreements, but the LP has never been re-printed. Now it is released in complete agreement with the musicians and compositions have proper titles. 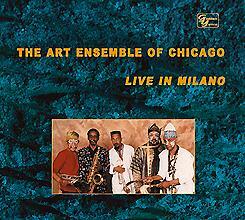 The Art Ensemble is at its best, in top form, in front of the ecstatic Italian crowd.